This appetizer is beautiful, fresh and simple to make. 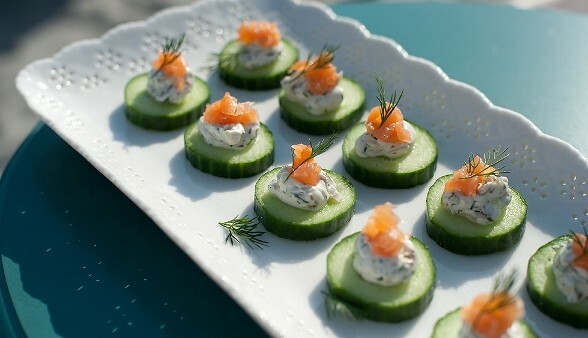 The classic flavors of smoked salmon and dill are wonderful. And the crunch of the cool cucumber makes this dish so refreshing! Place cheese, green onions, capers, lemon juice, 1 tablespoon chopped dill, salt and black pepper in a medium bowl. Whisk until combined. Scoop cheese mixture into a ziptop bag and seal. Snip off one corner with scissors. Pipe ¾ teaspoon of the cheese mixture on top of each cucumber slice. Top with ¼ teaspoon of chopped smoke salmon and a sprinkle of salt. Garnish with a piece of fresh dill. Keep in the fridge until ready to serve. Enjoy! Recipe by Lauren Marie (LaurenMarieGlutenFree.com). Photo by Angela and Anna Sackett.